Thanksgiving is officially behind us and while I have been itching to commence the holidays for what seems like months, now that they are officially here, I am wishing time would freeze. My goal was to finish shopping by today, Cyber Monday, but unfortunately, I haven’t even made a dent in my list. (I’ll be looking to several of my ideas I launched last week HERE – most all are still on sale). 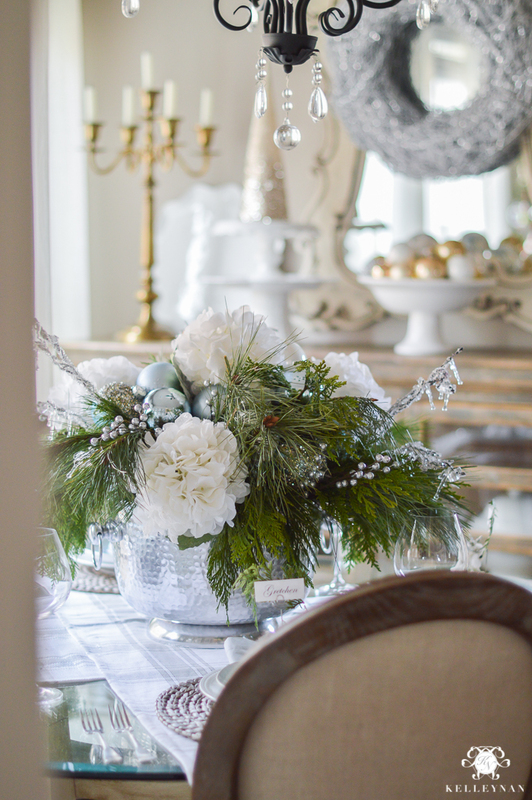 Once the decorating is finished and I have a grip on gifts, the focus switches to my favorite part of the holidays – the entertaining. 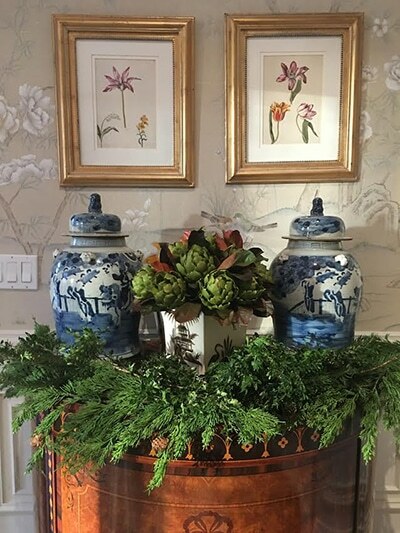 While I can get pretty elaborate dressing my table in the dining room (you can check out all my tablescapes HERE), I typically take a much simpler approach in this eating area, using a statement centerpiece to set the tone. 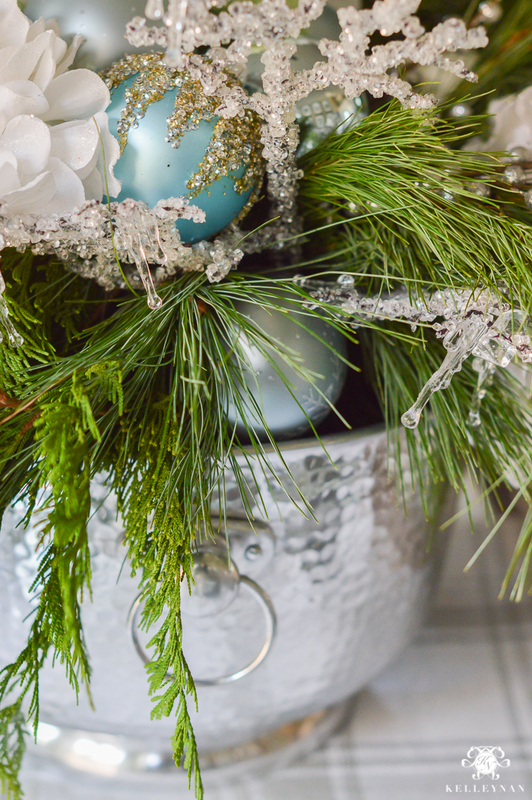 I also used a few silver berry picks, some icicles, and then nestled a few icy blue ball ornaments in the arrangement to up the festive factor. 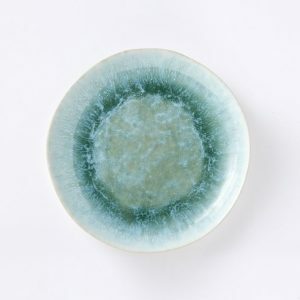 I just found these icy blue salad plates last week and fell in love! I only have a few sets of dinner plates but salad plates are my weakness because you can change them up so easily for a different look. 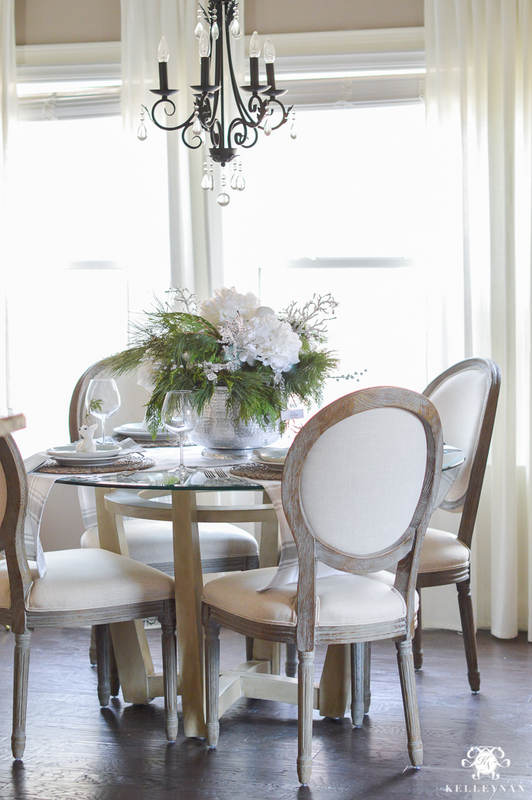 I get a lot of questions on my table and chairs – you can currently get my chairs (HERE) for up to 30% off and my table was a DIY, transformed from black and orangey-copper (HERE). 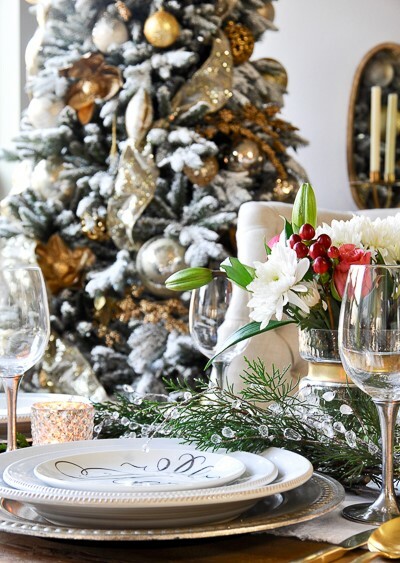 While it is the season to celebrate with lots of friends, family, neighbors – and basically, everyone you know – don’t get so busy that you don’t make time to enjoy the small, quiet times. Plan a low key night in with your closest friend(s), wear pajamas, and even order take out. Remember to enjoy the season. 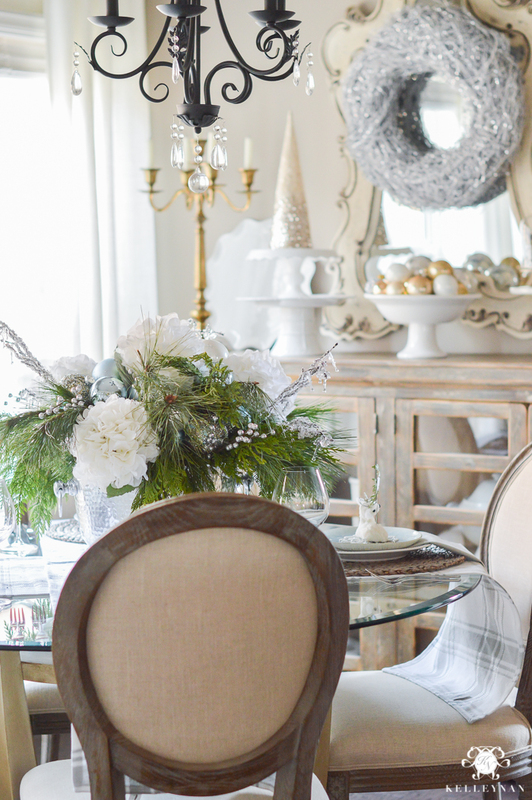 Next, head to my friend Kris’s home at Driven by Decor – I have shared her entertaining ideas too many times to count because I always glean so much inspiration from her. 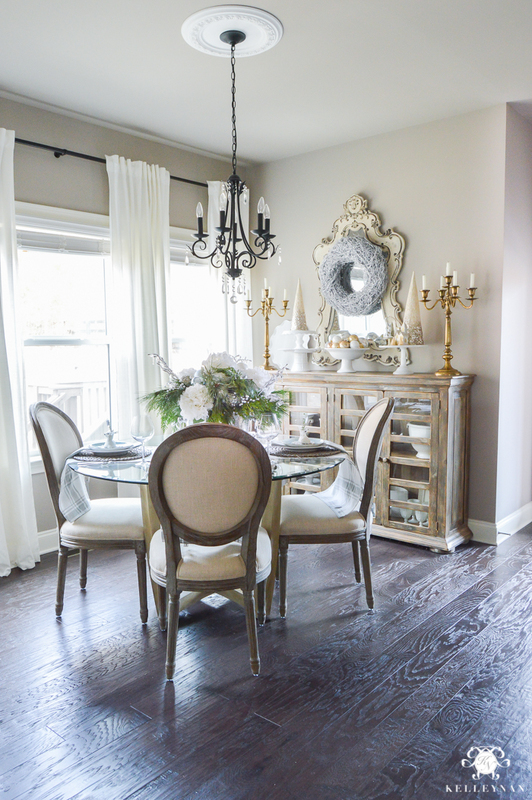 Today is a special treat because instead of hosting in her dining room, she will be set up in her breakfast nook – and, you HAVE to check out her stunning DIY banquet! Click HERE to get to Kris’s home and she will send you on to the next person in the loop at the end of her post. To make sure you don’t miss any, below is a preview of everyone on today’s tour, along with what’s to come later this week! Love everything! 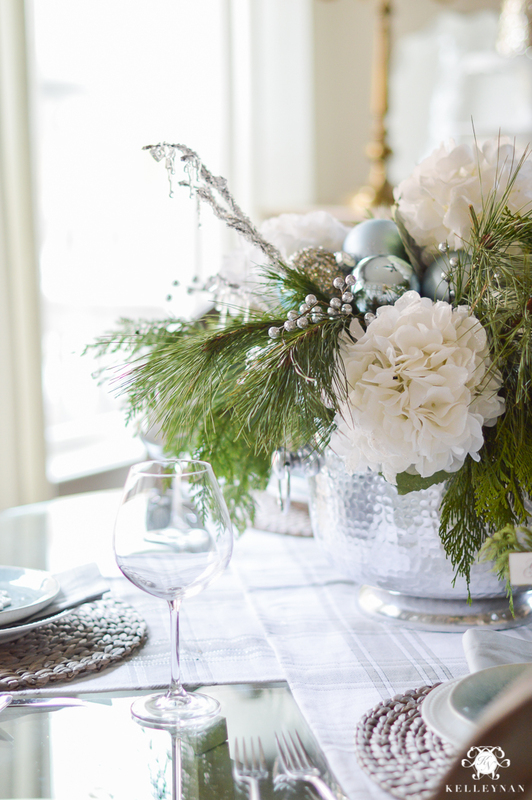 Hydrangeas are unpredictable but you saved the day and the arrangement is fabulous! 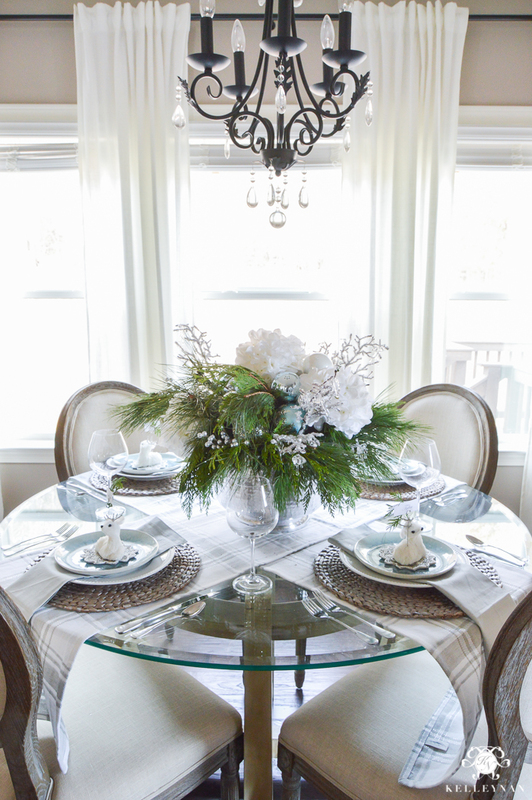 Your decor is so fresh and inviting! Tam, THANK YOU! They were a quick, last minute purchase this past week haha. Can’t wait to see yours!! Kelley, this is gorgeous, as usual!! Haneen, thank you! 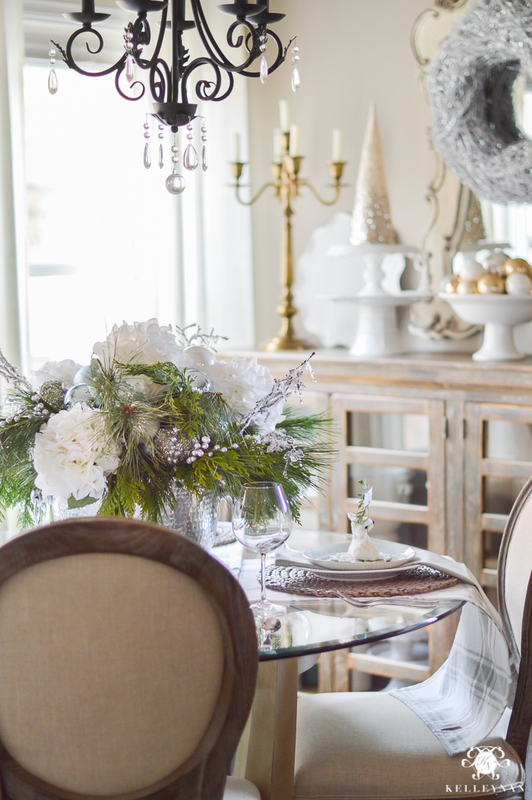 So excited to see what you do in your bold dining room this year! Bree, YOU ARE THE BEST!! Merry Christmas- I can’t wait to see your home all aglow! 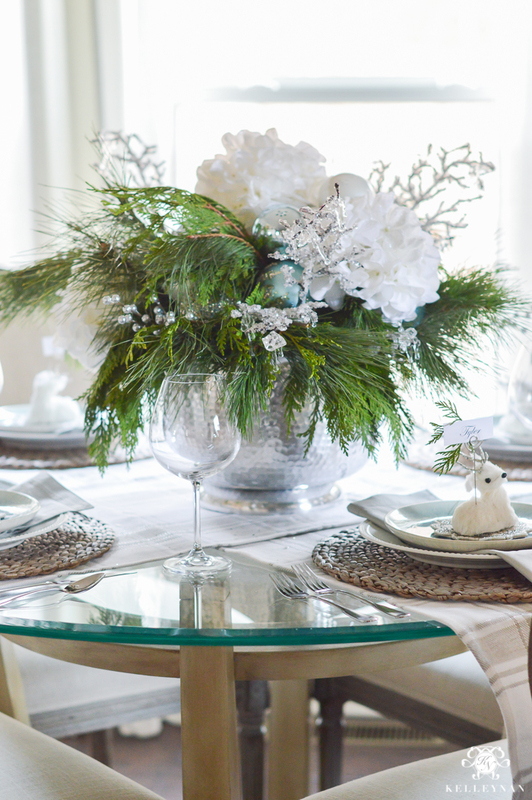 Another beautiful table Kelley Nan – love, love, love the blue! You are awesome and most inspiring! Joni, thank you my sweet, supportive friend! Such a charming, cozy setting. I absolutely love your arrangement. When I looked on line the plates looked more mint than blue. Are they the same? I seriously want to buy everything on your table!!! 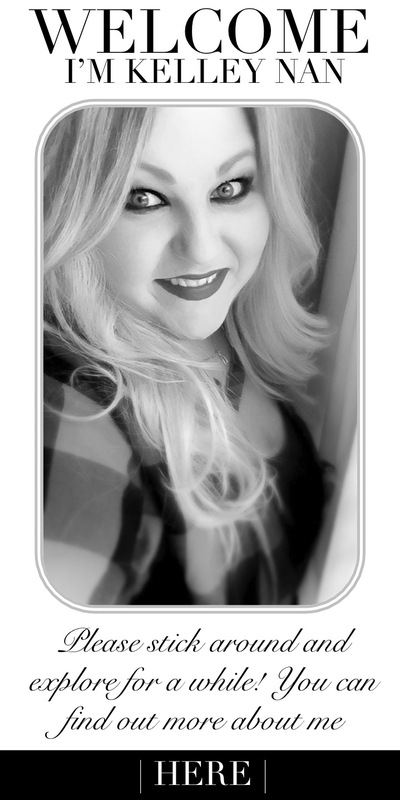 Hi, Staci! They are definitely more blue than green. Kind of an auqa. The center part is the most green-ish. 😉 Thank you for your sweet words! haha! Awesome! I can’t wait to jump on and knock out gifts tonight! Kelley, Simply stunning! 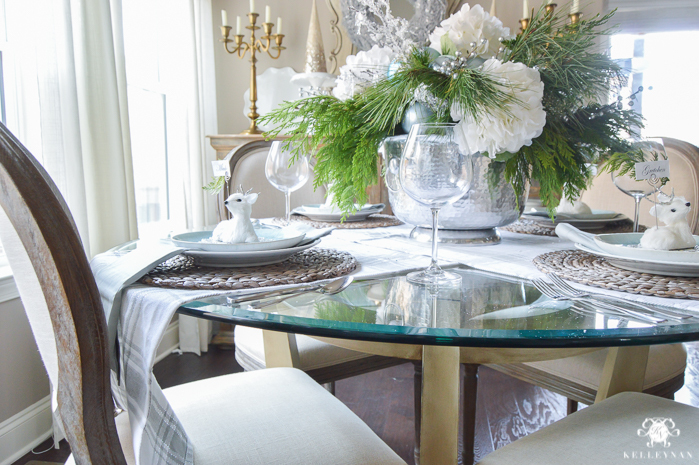 Your table is cozy but does not lack in elegance! 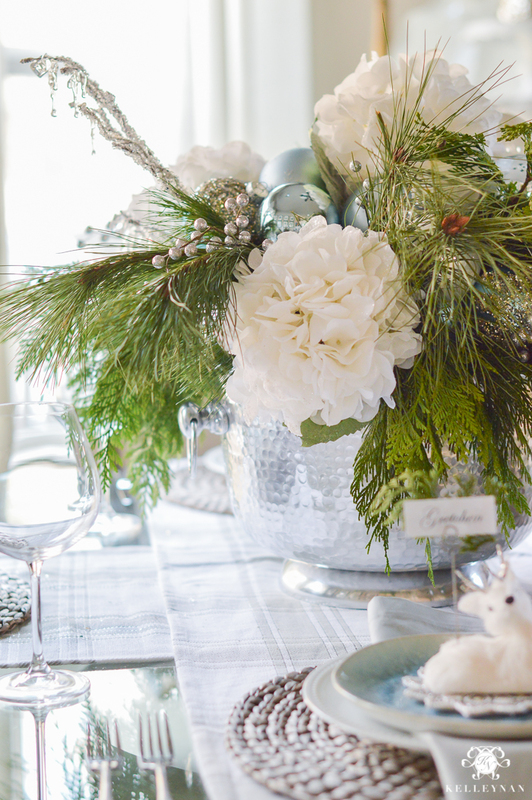 The centerpiece is magnificent! I’m so inspired! Yvonne, thank you!! I can’t wait to see yours!! So pretty, Kelley! 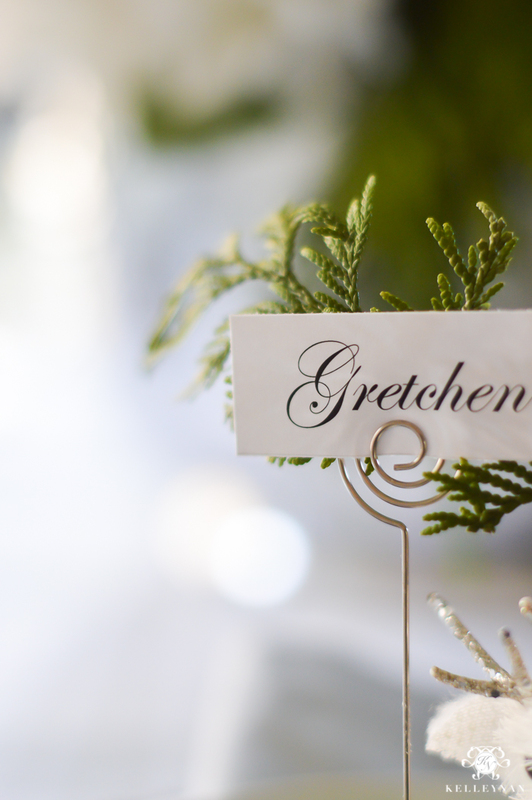 Love those sweet little deer placecard holders! LOVE it all Kelley! Your table is gorgeous and your sentiments on point. 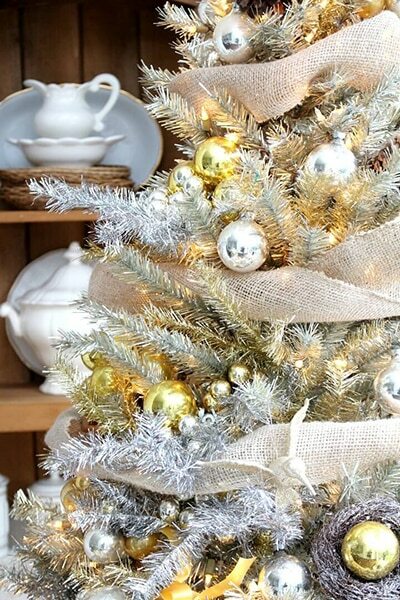 While it is fun, festive & wonderful to get all wrapped up in the holiday fervor, making time to relax & enjoy with your close friends & family is really the heart of the holidays. I know yours will be beautiful in all ways! Kelly this was gorgeous! 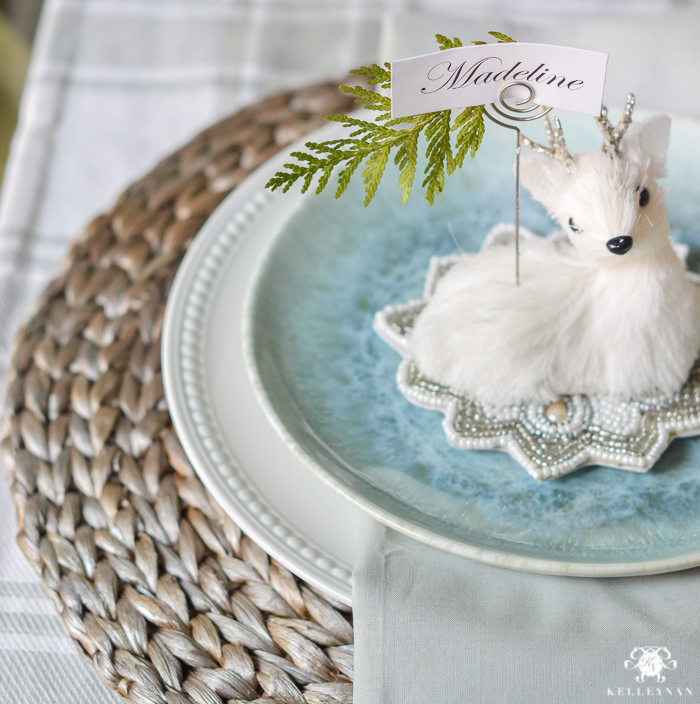 I just love the attention to detail you put into your tablescapes with the names and sweet little deer atop plates! That ice blue is stunning! oh dear… I know how to spell your name Kelley – so sorry for the typo (time to head to bed, lol) xo! I’ve become somewhat of a kelleynan.com stalker. Every time I come here I am filled with awe…and today is no different. 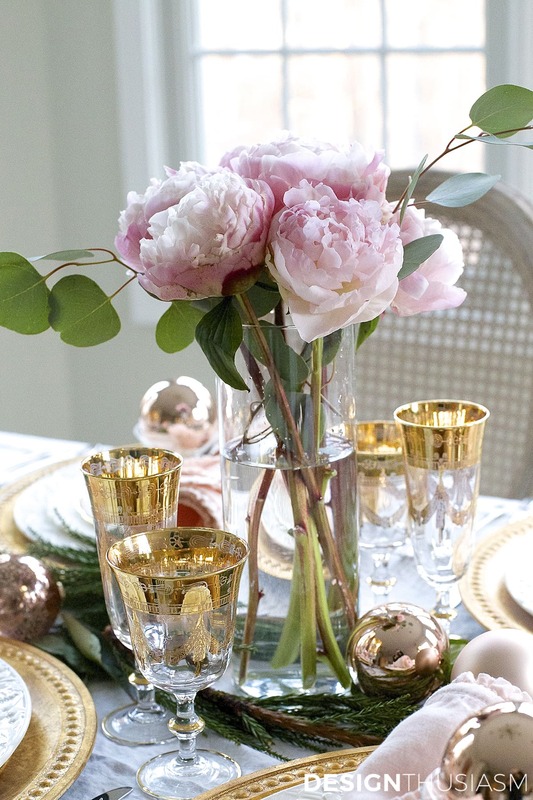 Your table is stunning and simple at the same time. Do you know how hard that is to accomplish? Yet you do it all the time. 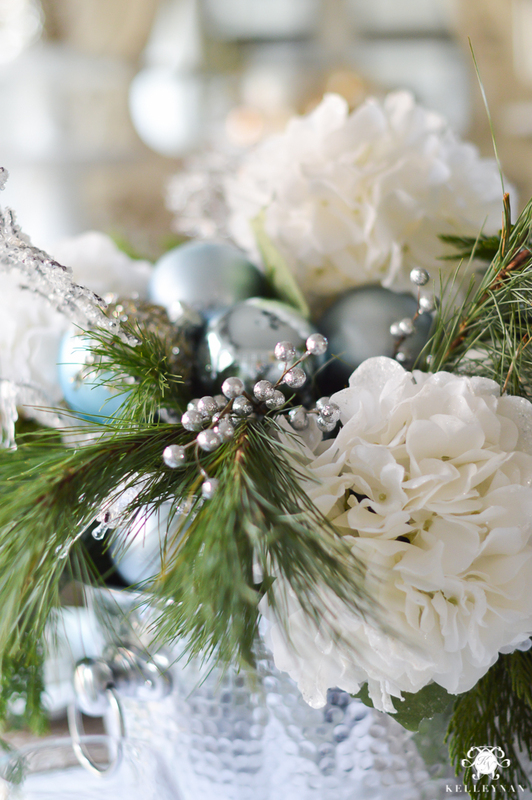 Happy Holidays and best wishes for an amazing New Year! Always so pretty and elegant and just the right touches without being too much. Beautiful Kelley! Janet, thank you! I am so excited to make time to go see yours! It’s just stunning! I love that buffet. Everything is perfect. So fun being on the tour with you. This is really beautiful. 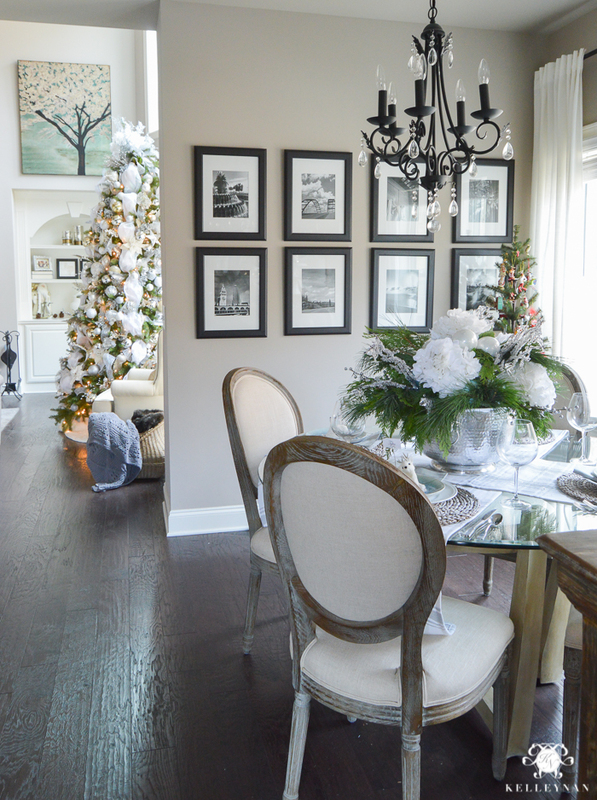 The centerpiece is so festive and I love the shot looking into the room with your tree!